Jean Pascal is not a complicated person. And if you want to understand his character and outlook, all you have to do is consider a strange moment shortly after the final bell in his rematch with Bernard Hopkins back in 2011. Pascal’s second chance to best “The Alien” did not go well for the Haitian-Canadian. He appeared at times flustered and frustrated while Hopkins, older than his opponent by an astonishing 18 years, did his usual cagey thing with the clinches and the taunting, pot-shotting with his right hand and generally having things his way. At one memorable point, Pascal for some reason was slow to answer the bell and Hopkins, to the delight of the crowd, got down and did a few push-ups, upstaging the younger fighter as he had throughout the pre-fight build-up. Afterwards, while everyone waited for the official decision, which all knew would go to the 46-year-old veteran, making him the oldest fighter in boxing history to win a world title, Hopkins went down on the mat again and did some more push-ups as the crowd cheered and clapped. And Jean Pascal, ever the competitor, ever wanting to prove himself, proceeded to get down on the floor and do some push-ups of his own. This is really all you need to know to understand Jean Pascal. Kovalev and Pascal at the press conference. At the pre-fight press conference last Wednesday before what would prove to be an astonishingly violent confrontation between Pascal and the Russian phenom Sergey Kovalev, Cathy Duva, Kovalev’s promoter, got off the single best line. Pascal is somewhat unusual among boxers in that he employs a team of prominent trainers and advisers, instead of a single individual, to oversee his preparation. At the press conference, Pascal and his retinue expressed much consternation over published comments by Kovalev’s lone trainer, John David Jackson, which questioned the challenger’s skills and those of his lead coach, Marc Ramsay. “You should know better, John,” scolded one of Pascal’s team members, Russ Anber. A short while later, after yet another of Pascal’s trainers explained to the press why the challenger would prevail, Duva stepped to the microphone and quipped, “Well, I must say I’m glad this fight isn’t between John David Jackson and Pascal’s 15 trainers.” The second Duva sat back down, Pascal charged the podium. “You know why I have 15 trainers? Because I’m a general! I’m not a follower, I’m a leader! I’m not a sheep, I’m a wolf! I’m a general!” And then a few minutes later Pascal tried to take off Kovalev’s hat. Again, this is all you need to know to understand Jean Pascal. From the opening bell last night, the Russian champion’s advantage in sheer power was evident. But Pascal, who thinks of himself as a uniquely sophisticated and athletic boxer in the vein of his idol, Roy Jones Jr. (who happens to be one of his 15 trainers), did not cede ground or look to avoid exchanges. 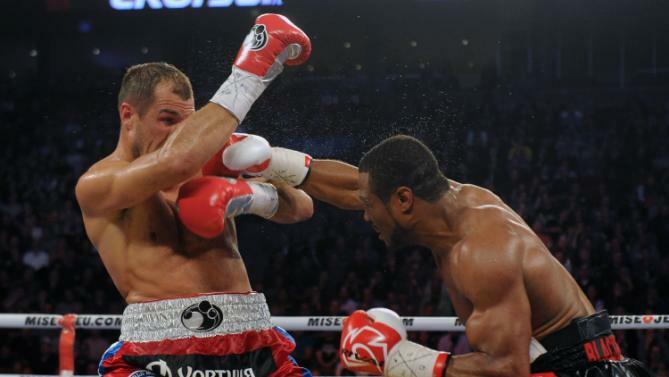 Near the end of round one he came straight at Kovalev and unloaded two big right hands. They both missed but the crowd roared in appreciation. In the second, in opposition to expectations and, one would assume, his own tactical preparation, he stayed directly in front of the champion and exchanged power punches. This made for a riveting contest, but it also, whether Pascal realized it or not, doomed his chances of winning. 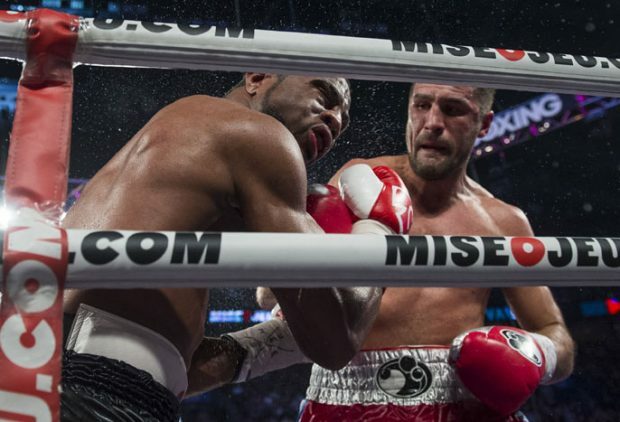 The first half of round three gave the fervent Montreal crowd much to cheer about as the two warriors continued to trade, Pascal landing clean blows on several occasions, before the inevitable occurred: Kovalev launched a series of bombs and a left hand snapped back Pascal’s head. Seconds later another left shook the challenger. But Pascal did not clinch or wrestle to buy time to recover. He stubbornly maintained his posture and stayed in front of Kovalev who, like a hunter tracking his quarry, stalked his man, throwing heavy jabs to the body and right hands upstairs. The crowd roared when Pascal landed a big left of his own, but Kovalev shrugged it off, forced his opponent to the ropes and, just before round’s end, scored with a thudding right that almost sent Pascal out of the ring. The challenger’s glove touched the canvas and referee Luis Pabon gave Pascal the eight count. In his corner the former champion assured his 15 trainers he was fine; however he looked anything but fine for much of the fourth. He took a beating in the round’s first half, Kovalev swinging freely with both hands and pounding Pascal from corner to corner. The challenger emerged from the storm of leather with a face now showing a damaged right eye and a weary, if not resigned, expression. It was clear the Russian’s undeniable advantage in punching power was deciding the match. And then, unexpectedly, Pascal timed his man and threw an overhand right that landed cleanly on Kovalev’s jaw, forcing him to hold, and the Bell Centre erupted. Moments later, Pascal attacked again, landed another right, and the crowd shook the walls of the Bell Centre . Pascal was obviously outgunned and he had already absorbed alarming punishment but, astonishingly, round five clearly belonged to him as he connected with heavy power punches on a champion who looked to be tiring ever so slightly. In the sixth the pace slowed and at times Pascal appeared vulnerable, his lack of head or upper body movement making him an easy target. 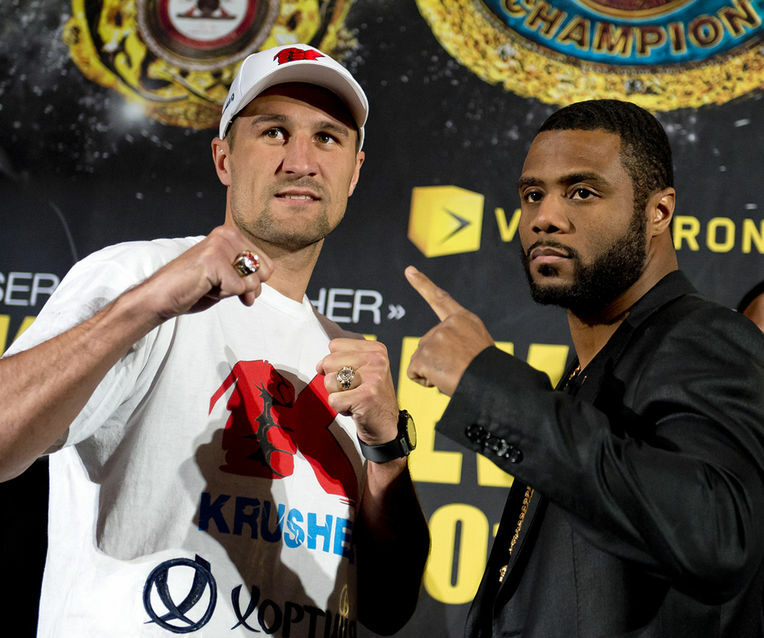 Despite his having won round five, one sensed he had yet to fully recover from the pounding he’d taken earlier and all could see that Kovalev was the fresher and stronger of the two. But at the end of the sixth, there was Pascal, coming forward and landing two hard lefts and then a right as the crowd cheered him on. Outgunned, battered, knocked down, tiring, and well behind on points, but holding his ground and firing big punches: this is all you need to know to understand Jean Pascal. But as the seventh began it was clear he had precious little left to give. He folded to the canvas in a clinch at the start of the round and he was throwing one punch at a time now, standing toe-to-toe and brandishing the only weapon he had left, the counter right to Kovalev’s jab. At the end of the round a flurry of punches from the Russian punctuated by a heavy left to the chin buckled Pascal’s legs. He had difficulty walking back to his corner and it was clear the bout was now, for all intents and purposes, over. The official conclusion in round eight proved chaotic. Kovalev slipped on one of the plastic decals on the ring floor and almost fell and the referee called a brief time-out as the champion righted himself. 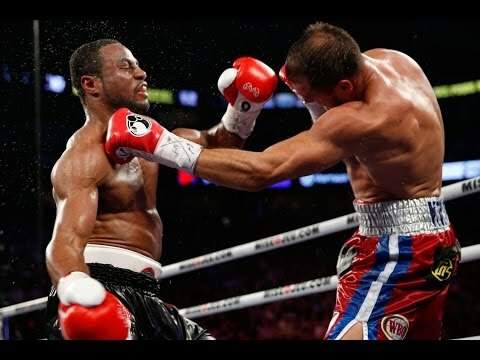 As soon as action resumed Kovalev went to work, battering an exhausted and still hurt Pascal with both hands and it was evident the challenger could no longer defend himself. A series of damaging blows sent him staggering back into Kovalev’s corner and as he fell against the turnbuckle he threw a desperation punch at the same moment that the pursuing Kovalev again slipped and fell. The crowd, thinking Pascal had scored a knockdown, went berserk, but the referee correctly ruled otherwise. But as he wiped Kovalev’s gloves, behind his back a dazed Pascal first tripped over a towel which John David Jackson was using to mop up water on the canvas, and then, clearly in terrible shape, he almost toppled over before stumbling and staggering, like a drunk at closing time on St. Catharine Street, from one side of the ring to the other. 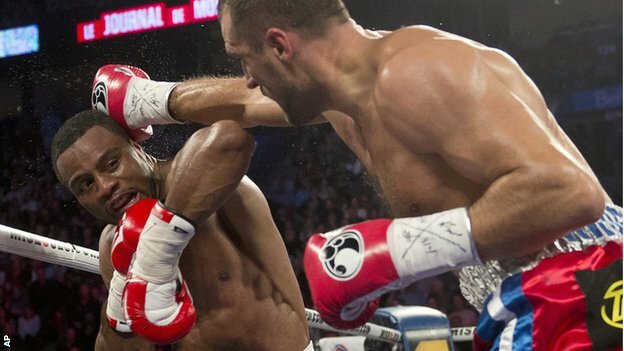 Dizzy and hurting, he drifted all the way from Kovalev’s corner into a neutral one before falling into the turnbuckle. Kovalev, seeing Pascal’s distress, pointed and grinned. The referee finally saw it too and asked Pascal if he was all right, but curiously, he did not ask him to exit the corner. It is doubtful whether he could have and, indeed, he never did. Action resumed and Kovalev strode up and landed two flush right hands on the stunned and immobile challenger before Pabon called a halt; it was clearly the right call to make. And here’s all you need to know to understand Jean Pascal: despite having taken terrible punishment over the course of the contest against a boxer who is clearly much tougher and far more powerful, Pascal ceded nothing. He protested the stoppage, insisted he could have continued, pleaded for a rematch, and promised his cheering fans in the Bell Centre he would be back. Outstanding coverage of a memorable contest, Mr. Carbert. Kovalev possesses outstanding talent to land his shots with precision and power. Put these 2 together and you have the makings of a knockout artist. Throw in the will and chin, and he may go down as one of the greats at 175.